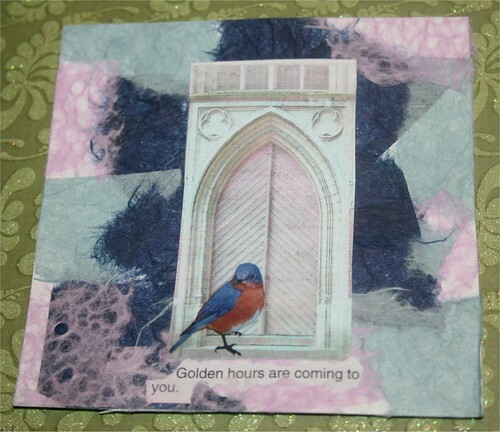 Golden Hours 4" x 4" Collage Card, originally uploaded by DianthusMoon. I’m really liking this collage I made a few days ago (made 4 others, not all finished yet). I took some of the homemade paper I had and ripped it up and glued it down for my background. The window and bird seemed to be the perfect addition with the ‘fortune cookie’ saying. My mom had gotten that one in her cookie and she wasn’t thrilled, but she is a real life ‘golden girl’. I am trying to use things that people have sent as ‘goodies’ to me in swaps. That’s where the flowers in the background came from. 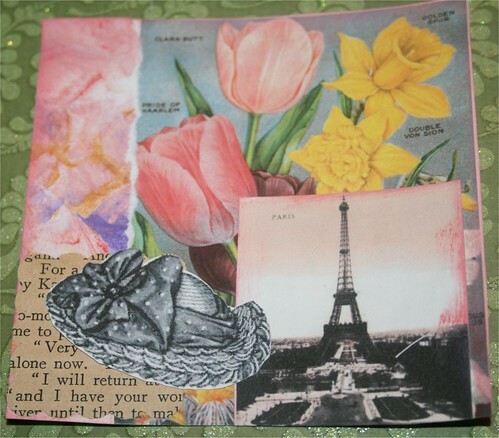 I then thought of ‘Paris in Spring’ and I am guessing it’s really beautiful there. I made another, but it will be sent to someone soon and I will share it when she gets it in the mail. I made two Christmas ornaments, one for me and one for mom. I had started hers about 5 years ago! I am sorry I didn’t pull the front taunt with ‘the thread method’, but they look fine. I have them under some weights now and will share later.